This is the first in a four part series. Our sister website thethirdpole.net’s Nepal Editor Ramesh Bhushal and photographer Nabin Baral travelled along the tributaries of the Koshi River from near Tibet to the Indian border to report on the challenges faced by people living in the region. In Nepal’s Sindhupalchowk district, close to the Tibet border, fast flowing water emerges beneath a huge pile of debris left by the landslide that devastated the village of Jure nearly two years ago. 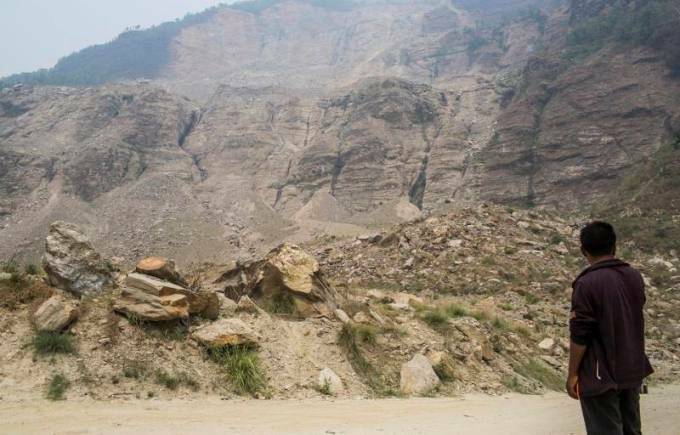 More than a year later, China has still not opened the border because of the high risk of landslides in the future, despite repeated requests from the Nepal government. Instead, China is focussed on clearing a road via Rasuwa — another district bordering Tibet that lies northwest of Sindhupalchowk — equally devastated by the quake. There are suggestions that China does not want to open the Sindhupalchowk border, and that it would rather link up with Nepal through the Rasuwa district which borders Kerung — the city to which the Qinghai-Tibet rail network is planned to be connected by 2020. However, the Chinese government has said that geological risks are the reason for not opening up the border. The 2014 Jure landslide swept away an entire village killing 156 people. Almost two kilometres of the highway collapsed, disrupting road travel for months. Even now you see only a few local buses and trucks carrying sand and boulders from the Sunkoshi river drive across piles of debris on the road. Climbing atop massive boulders, you can see the meandering Sunkoshi River below. The river originates in Tibet as the Poiqu and then flows down as the Bhotekoshi before meeting the smaller tributary called the Sunkoshi — one of the seven tributaries of the Koshi river. The Sunkoshi changed its course after the Jure landslide. The river was blocked, and formed a huge temporary lake that inundated several houses on the highway and submerged two multi-storey buildings and an electricity transmission tower. Since the deadly landslide claimed the lives of many of his relatives and fellow villagers, Tamang has been living in fear in a small hut a few metres above the riverbank. Last year’s earthquake made his life even tougher. “Living with what is left is the only way for me and the upcoming monsoon may bring more troubles,” said Tamang as he whetted his sickle to cut bamboo. Landslides are frequent in Nepal, where 85% of the country is mountains and hills. On average about 12,000 small to large scale landslides hit Nepal every year, killing more than 300 people. “Large landslides have the potential to block rivers. It has happened in the past and it’s likely to increase as intense rainfall patterns are predicted due to climate change,” says Narendra Raj Khanal, professor at the Geography Department in Tribhuvan University, Kathmandu. Those who can have left the villages, but for most people there is no way out. Twenty-two-year-old driver Lanka Lama has no job since the traffic along the once busy road has dried up. Business was picking up after the landslide, when the earthquake struck leading to the closure of the Chinese border, a few kilometres north of his village. “There are hundreds of youth like me in the villages who are having a really tough time. We are jobless and also landless,” said Lama who has lost his niece, many friends and relatives in the disasters. Although landslides are common in Nepal, experts are more concerned since last year’s earthquake, which is said to have induced more than3,000 landslides. The Koshi basin was one of the worst affected. The basin is the country’s most vulnerable region, with 40% of the area above 4,000 metres and 30% on steep slopes of over 30 degrees. “It has a high risk of big landslides and there is an urgent need to have a holistic landslide risk management plan, as landslides are complex phenomena,” says Deo Raj Gurung, a remote sensing specialist at the International Centre for Integrated Mountain Development (ICIMOD) based in Kathmandu. Many experts blame both the government and local communities, neither of whom listened to multiple warnings, for the high human casualties in the Jure landslide. “The area was categorised as a high hazard area in the 1970s and there were small landslides in the same area multiple times before it completely collapsed in 2014,” adds Gurung. This is not the only place so affected. Trouble is brewing in the mountains from which rivers like the Sunkoshi flow. Glaciers are melting faster due to increasing temperatures, various studies show. Last year, an international team of scientists published the first detailed study on glaciers in the Dudhkoshi river basin — one of the major tributaries of the Koshi. The Dudhkoshi flows through the Mount Everest area. The scientists warned that almost all of the glaciers in the Everest region may disappear by the end of the century. The altitude of freezing level is also shifting higher, increasing glacier melt and decreasing the amount of snow accumulation, the researchers said. Thousands of tourists come to Nepal every year to get a glimpse of Mount Everest and other high peaks in the Himalayas. But what would happen to the majestic beauty of the mountains if the snow and ice vanished? These mountains are also the source of water for millions of people living downstream who depend on them for their lives and livelihoods. This is what worries Apa Sherpa — who has climbed the Everest 21 times. He wants to galvanise the global community to save these mountains. In 2012 he trekked about 1,600 kilometres through the mountains of Nepal for about three months, as part of a team, to show the world the impacts of climate change on the ground. “The most worrying issue is that the mountains are holding less and less snow and I can feel it when I climb Mount Everest. It’s not a normal phenomenon,” he says. 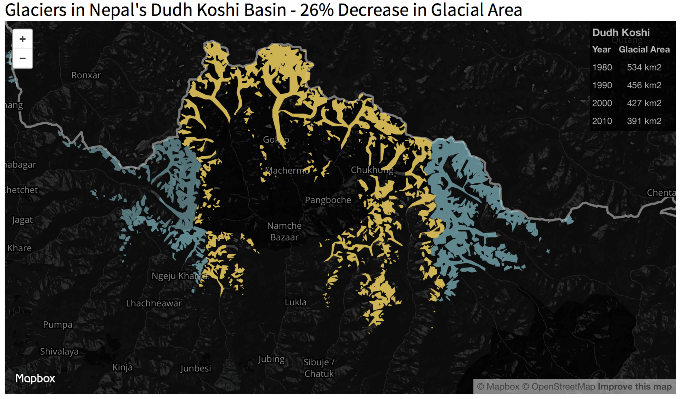 From 1980 to 2010, the Dudh Koshi has lost over 140 square kilometres of glacier area. Click the image to explore the animated visualisation. We travelled along the Sunkoshi River which has been identified as high risk for Glacial Lake Outburst Floods (GLOF). Sixteen of the 24 glacial lake outburst floods recorded in Nepal’s mountains occurred in the Koshi basin, according to ICIMOD — including three devastating ones. The Zhangzambu glacial lake in the Poiqu river basin in Tibet is the origin of the Sunkoshi. The lake burst in 1981, releasing 19 million cubic metres of water in an hour. The flood destroyed several houses, damaged 12 bridges and 27 kilometres of road and also one of the gates of the Sunkoshi hydropower dam. Ovidhoj Karki from Pangretar village on the banks of Sunkoshi River witnessed the 1981 flood. The villagers have been warned many times since that it might happen again. Glacial lakes are high up in the mountains, but the chances of villages and fields being swept away is growing because these lakes are expanding faster due to faster melting of glaciers, say researchers. “We don’t know what’s going on up in the mountains but we have lost several hectares of our paddy field in the last few decades due to floods,” said Karki. GLOFs are highly unpredictable and often disastrous, but their impacts can be mitigated to some extent. “One possible way is to install early warning systems down the river to alert communities. But the long term solutions are to discourage settlements in flood prone areas and relocate villages to safer places,” says Narendra Khanal. He has done extensive research in the area. The government has taken some steps to reduce risks, but not nearly enough. Nepal’s Department of Hydrology and Meteorology has installed a water gauge a few kilometres upstream in Bahrabise, which can alert people once the water level in the river rises above normal. However, when we visited it was in dire condition and had not been maintained properly.